Random Spam with China Glaze, Mavala and Sally Hansen - Polish This! I have another quick random spam post for you guys today, this time with polishes from China Glaze, Mavala and Sally Hansen. If you are not familiar with random spam posts, I like to use these to post about some polishes that I feel like aren't maybe interesting enough for separate posts. This doesn't necessarily mean that I don't like the polishes or that they are somehow bad, usually I just have something more interesting to post about (like manicures with nail art or some other nail design). So first off, I have China Glaze Hello Gorgeous!, three coats, no base or top coat. The name really suits this polish as it is really a gorgous light pink glitter. The first picture is taken in shade, the two after that are in sunlight. This was really a hard one to capture and it looks way better in real life than in my pictures. It's so much more sparkly and vivid than my pics made it look like. 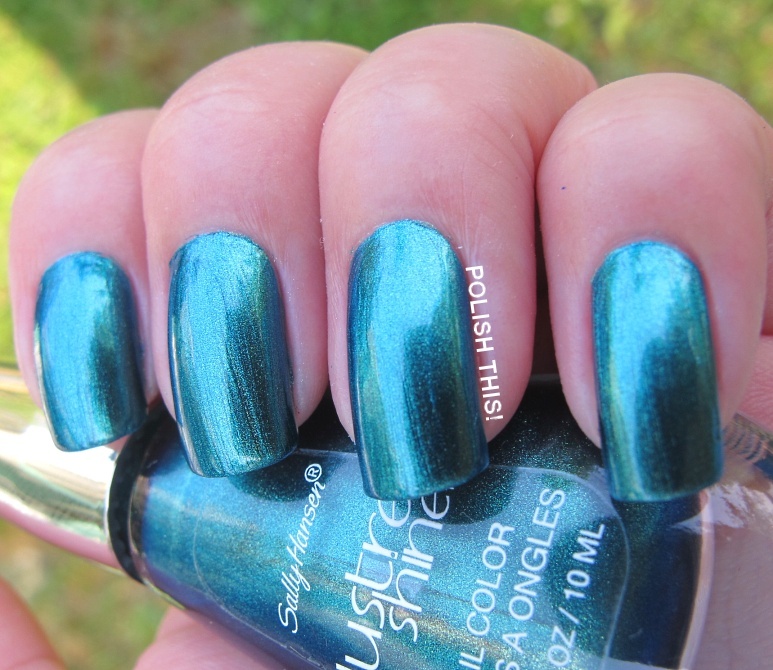 Then the last one is Sally Hansen Lustre Shine polish called Scarab*, I have two coats here, no base or top coat. I got this one also from the goodie bag and I'd say I liked this way better than the Mavala one. It's not the color that I would be choosing first for my self, but it is still very pretty and it had really nice formula. It coveres with just two coats and it's not too brush stroke-y, at least not for me. Of course with this type of polish, there are always some visible brush strokes. *I got two of the products in this post from the goodie bag from our meeting, for more information see my disclosure policy. I think I like the Mavala best!